You don't have to be Welsh to join in the fun! Race at Pembrey, and other classic circuits by joining one of the friendliest racing clubs! The DASH2 PRO display has been updated for 2015 to add new powerful features. 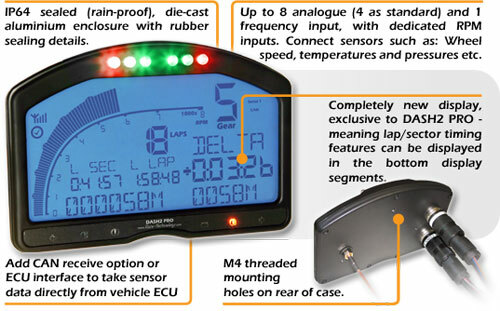 The Automatic Lap Timing makes setting up lap/sector markers for each circuit automatic. Simply start logging and the DASH2 PRO will select the correct track for your GPS location from its internal database. Automatic markers: If no lap file is already available for the current circuit then the DASH2 PRO will create one automatically, adding sector markers until a marker is passed again (creating a lap marker). Markers are automatically added onto the circuit’s straights, these are calculated using the GPS and accelerometer data.Lap timing can also be manually setup, by making .lap files in the Analysis software or by adding markers from an assigned button press.For an explanation of how the automatic lap timing works please visit here. A range of enhancement options are available for the DASH2 PRO, to specify a complete system tailored to your requirements. Complete data logging with GPS and integrated accelerometers; access vehicle sensor data via the CAN bus or ECU; and control external systems with the output drivers or PWM outputs. The 2019 Welsh Sports & Saloon Car Championship starts this weekend! The 2019 British GT racing series starts on Easter Monday and Welsh drivers will be driving hard for the top honours! Damian Longotano wins the 2018 Colin Gundersen Trophy!